Rudolph, one of Santa’s reindeer and a favorite among children was born over a hundred years ago. There were eight other reindeer on Santa’s sleigh. Rudolph with his red nose was a creation of Robert L. May, who worked as a copywriter at the Montgomery Ward department store in 1939. He told the story of Rudolph and how he was teased by the other reindeer. However, when Christmas Eve turned foggy, Santa worried about how he would deliver gifts that night, and to his amazement Rudolph saved Christmas and lead the sleigh by the light of his red nose. Years later, Johnny Marks (a friend of May) wrote the song based on Rudolph’s story (1949) and recorded by Gene Autry. This story has evolved and translated into twenty-five languages. In 1964, it was made into a television movie, narrated by Burl Ives. For decades, this movies has enlightened children each holiday season. Below are four crafts to use in the classroom as you incorporate a reindeer theme into your curriculum plans. They make great decorations or gifts to send home during the holidays. This traditional craft has been used for many generations. By using the child’s hands and foot, a reindeer will be born. Trace around the child’s shoe on brown construction paper or a brown grocery bag. Then, trace around the child’s hands on orange paper. Together cut out the pieces. Help each child to glue his hands on the back of the foot’s top as antlers (one on each side). By drawing on eyes (or glue googly eyes) and black eyebrows, Rudolph’s face can be created. Glue on a red pom-pom or a ball of red tissue paper as the reindeer’s infamous nose. Put a small handful of dried beans into a plastic sandwich bag. Take a white paper plate and fold in half. 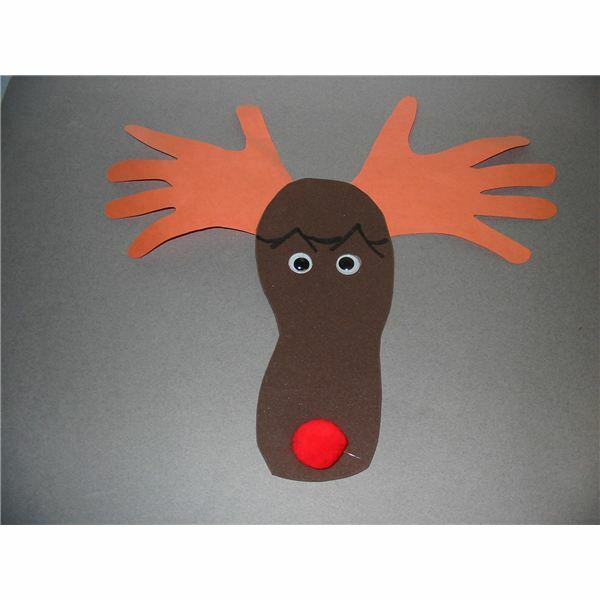 To this, the children can draw a reindeer face on one side of the folded plate, two eyes and a red nose. Tape a wooden craft stick inside the folded plate along with the beans and staple the edges shut. To make antlers, trace around the child’s hands. Cut them out and attach to the top of the plate, one on each side. This makes a great rhythm instrument to enhance singing the song. The last of these traditional reindeer crafts makes a cute and quick reindeer. You will need three clothespins (either spring type or traditional). 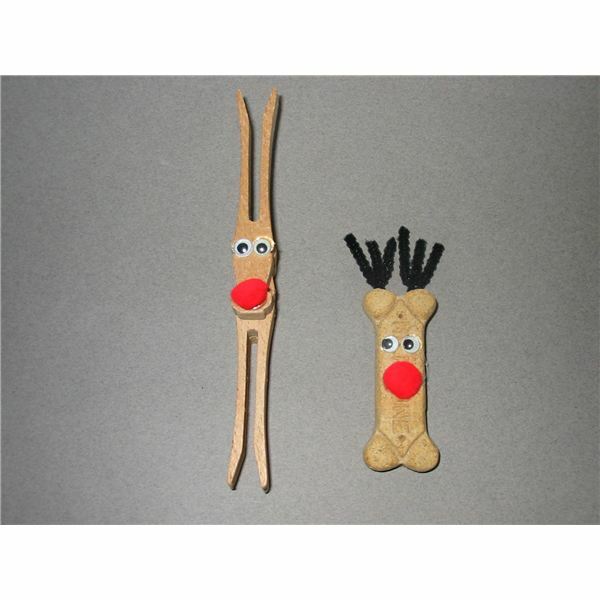 Help the children to glue two pins pointing down (4 legs) and the third pointing up (antlers). Use heavy tacky glue or for quick results, a glue gun (with adult supervision). Add small googly eyes and a tiny red pom-pom nose. Place the dog bone vertically on the table and invite the kids to glue on google eyes and a red pom-pom nose. Take a pipe cleaner and bend it into an antler shape, gluing this to the back of the bone above the eyes. You will need two antlers. Adhere a magnet strip to the back, so this craft can be used as a refrigerator magnet, which makes a nice gift to send home. Teachers can coat the dog bones with spray varnish on all sides. This will keep the bone from smelling like a treat. Alert parents to keep this magnet up high and out of the family pet’s reach. Enjoy a theme-related snack while making these reindeer crafts for preschool together. This may also be a starting point to begin discussing winter animals and how they adapt to the seasonal weather. These crafts contain small parts. Please supervise children at all times to prevent them from placing these objects into their mouths.